The fourth and final West Mids Elects Public Debate took place at The Vox, Resorts World Birmingham at the NEC on Sunday 23rd April. If you missed it, the following links are here to help you catch up. Watch clips from, or the whole Public Debate, on the Birmingham Mail Facebook page here. Read more about the final Public Debate in the following articles. The newest addition to the NEC Group’s portfolio of high quality venues – including the ICC and Barclaycard Arena in Birmingham city centre – opposite the Genting Arena on the NEC Campus, the Vox Conference Centre is within Europe’s first leisure and entertainment destination under one roof, Resorts World Birmingham. Along with our Partners, we are very grateful for the support we received from the NEC Group. All our venues provided dramatic backdrops for important Public Debates, together representing the strengths of the West Midlands from industrial heritage to culture and tourism; commerce and conferencing to peace and community. 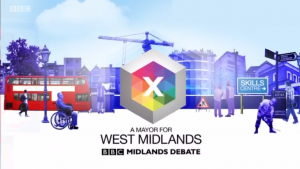 A Mayor for the West Midlands – live TV Debate with Patrick Burns and all six candidates. Hear from five candidates who are aboard the ITV News Central West Midlands #mayorbus touring the consistuencies. If you have a question or an opinion – have your say.